The problem is that this is not what the story is about. Neglecting some of the more peripheral details (which are themselves important to the episode), we should at the outset say that in the context of the first century world Martha was simply doing what was normal and expected. There is nothing particularly religious or outstanding about Martha’s reaction to Jesus’ presence, as if she were attempting some kind of religiously-oriented work; on the contrary, she was doing what she may have been expected to do had any male entered her house. Mary, on the other hand, sits at the feet of Jesus. Like Martha, the response of Mary to Jesus’ presence, far from being an act of religious devotion, was well-known in response to other, non-divine people. While people in the first century normally sat on chairs during a meal, or on couches during a banquet, Mary’s act of sitting at the feet of another was uniquely the place of a disciple. More specifically it was the place of a student learning from a rabbi. This was not uncommon, though in Mary’s case it was odd due to her lack of male-ness. For Mary to forego her expected role as a woman, namely preparing a meal, she would have been committing a reasonably shocking act. Moreover, those who took on the role as disciple in first century Judaism would normally have themselves aspired to be like their master, that is, to be a rabbi; Mary however, as a woman, could not have become a rabbi. 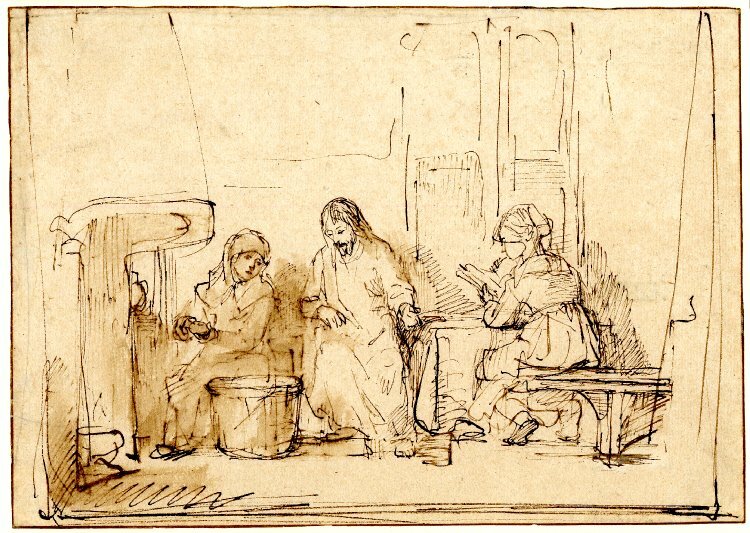 Martha’s petitioning Jesus to intervene in order that Mary might help is understandable – Martha would have been doing an immense amount of work, particularly if Jesus’ other disciples were present. For her to see Mary doing nothing would have seemed unfair, and culturally odd. Mary has chosen the better option – she has chosen the path of discipleship (symbolised by sitting at Jesus’ feet) over cultural norms (about which Martha is anxious). Jesus is here affirming the place of women on the discipleship journey, which is a risk given the cultural subversion involved, as well as the fact that many rabbis viewed teaching a woman as constituting sin. This story is, in the end, not at all about personal religious devotion holding priority over works or service; such an interpretation creates a dualism that is alien to biblical thought (I think paradigmatically of Jesus’ love command – love of God is necessarily and primarily demonstrated in love for others, one cannot precede the other). The Martha and Mary story is, rather, a story about Jesus’ subversion of cultural norms that exploited the oppressed, in this case women. This is not simply about allowing women to be educated, though that is a central issue; rather, this kind of subversion would have affected every aspect of accepted thought about women, including social roles and expectations, value attributions, household codes, and theological assumptions and traditions. Jesus is not simply making a minor edit to accepted gender roles in his time; he is destroying them. He then affirms their replacement with an unheard of code of equality and egalitarianism. For Jesus a central aspect of his kingdom program of preaching good news to the poor, freeing captives and releasing the downtrodden (Luke 4:18-19) is releasing women from situations and systems that oppress them (seen throughout Luke’s Gospel). Jesus’ kingdom message is, after all, about real life in a real world; he is not content to allow Christians to forfeit being an alternative community in the world in favour of a poorly thought out being/doing dualism that permits personal devotion separate from tangible works, based on an ahistorical (mis)reading of Luke 10:38-42. In fact if anything the story of Martha and Mary concretes the very opposite – that Christians are to embody completely alternative values and lifestyles to the rest of society in accordance with the kingdom, which enhance the life of the oppressed and marginalised, demonstrated in a holistic compound of being and doing, devotion and works, worship and action. The Greek for “at the Lord’s feet” (πρός τούς πόδας) is strikingly similar to Paul’s insistence that he was educated “at the feet of Gamaliel” (παρά τούς πόδας) in Acts 22:3 (both Lukan phrases). Bruce J. Malina, The New Testament World, (Louisville: Westminster/John Knox Press, 1993), 49. 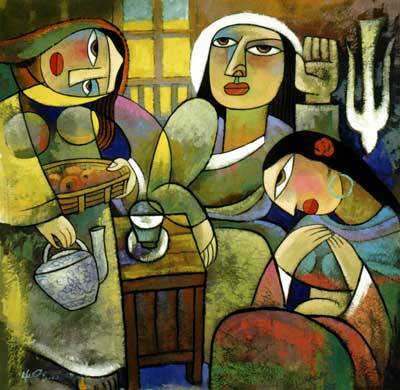 Posted on June 8, 2011, in New Testament, Sexuality & Gender and tagged Feminism, Gender Roles, Jesus and Women, Luke 10:38-42, Martha and Mary, Oppression of Women. Bookmark the permalink. 5 Comments. When this passage is read out loud, Martha has traditionally been given a whining or cranky voice – Lord, don’t you care that my sister has left me to all the work…? It makes her sound as if the only thing she is worried about is the work. But think about when a woman says in front of guests to her spouse or child, “Dear, could I see you for a moment in the kitchen?” – you know she’s got a whole lot more to say. If you give Martha a slightly higher voice of forced cheer and politeness, through gritted teeth, the speech becomes one that sounds like she’s asking for help in the kitchen but probably has the sub-text “Jesus, do you realise what is going on? She is bringing shame on our family by being in the men’s space! Don’t turn a blind eye to her sitting there – all your disciples aren’t, they’re muttering amongst themselves about the breach of propriety. Save our reputation and GET HER OUT OF THERE!” And Jesus understands, and answers her. Yes, agree with Sue above. Surely Martha is highly embarrassed at Mary’s behaviour. The male disciples must have been shocked and were thankful tat Martha spoke up. Love to have seen their reaction when Jesus affirmed Mary. That’s alright, we all have to change; I have to teach women now… thanks a lot Jesus! Check it – the McKinnon’s bring the wisdom! Thanks for that guys, great expansion on the cultural oddity of Mary’s behaviour and Jesus’ affirmation of it.